Lakeside Retreat - Ubicación perfecta para parejas o familias con vistas inmejorables! Alquiler a estrenar VRBO! 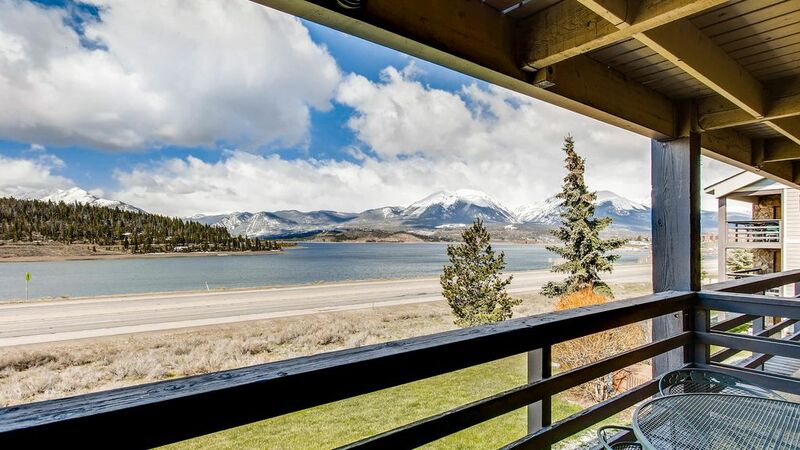 Disfrute de este espacioso y bien amueblado condominio de 2 dormitorios a la derecha en las orillas del lago Dillon en el corazón de Colorado Ski Country. Con vistas espectaculares del lago Dillon y los picos nevados de la gama de diez millas de la derecha de su gran balcón privado, este condominio actualizado tiene todas las comodidades y comodidades del hogar, mientras que poniendo justo en el corazón de todo lo mejor que Colorado tiene que ofrecer. Le encantará la planta abierta y vistas increíbles fuera de la pared-a-pared correderas puertas de cristal que traen toneladas de luz natural. No hay mucho mejor que beber una taza de café por la mañana mientras contempla el magnífico paisaje de montaña. Tendrás acceso a 5 estaciones de esquí de clase mundial justo enfrente de tu puerta, a 5 minutos de Keystone, a 15 minutos de Arapahoe Basin y Copper Mountain, a 20 minutos de Breckenridge ya 30 minutos de Vail. También hay un autobús gratuito a Keystone justo fuera de su puerta que sale cada 30 minutos! Después de un día de esquí, disfrutar del acceso a la bañera de hidromasaje y sauna y construir un fuego en la chimenea de leña antes de acurrucarse en el sofá. Si vas a venir para diversión de verano, no hay mejor ubicación. Usted está con vistas a las orillas del lago Dillon ya menos de 5 minutos de la Marina Dillon donde se pueden alquilar veleros, pontones, barcos de pesca, tablas de paddle y kayaks - o simplemente disfrutar de una cerveza junto al lago en el famoso Tiki Bar . Disfrute de excelentes campos de golf, senderismo de clase mundial y senderos para ciclismo, pesca con mosca - todo justo fuera de su puerta. También tendrá acceso a la piscina de la casa club. Si tienes niños, hay un gran parque infantil justo en la orilla, junto con un anfiteatro que alberga conciertos gratuitos durante todo el verano con el lago y las montañas como telón de fondo. También está a pocos minutos de la ciudad de Dillon y Silverthorne, con excelentes restaurantes, pubs, cervecería, supermercado, centros comerciales populares, alquiler de esquí, y todo lo que pueda necesitar durante su estancia. The overall stay was great. The condo is close to a lot of ski resorts that we wanted to visit. The condo was clean and ready on time. We're so glad that you enjoyed your stay! Safe travels and we'd love to have you again! This place was over the top! They thought of everything! Fully stocked kitchen! The view was inane beautiful and they even provided super awesome binoculars to sight see out of the solid view on sliding glass doors or back porch! The wood burning fireplace was a must have for me! The living room was perfect and the kitchen looks into the dining which made hanging out while cooking exactly what I was wanting! The parking is easy and convenient. So close to town and all the resorts! But nothing beats the view... morning, afternoon and evening....always perfect! We will for sure be staying again! They even provided wood for the fireplace! Who does that!! These folks do! Washer and dryer were a major plus also! We really felt at home! I don’t have nearly enough words to express how perfect this condo is! We saw just as much sun as we did snow and the plows come through constantly so the roads were never an issue! My mom enjoyed reading the books provided and we loved playing the games as well. The couch was super comfy and so was the king size master bed. We were worried about staying warm, not a worry at all! The heating system worked amazing, we were always warm and cozy! We cannot wait to return next year! Our family of 4 (2 adults/2 kids) trip to Keystone was terrific from 12/31 thru 1/5...The condo was perfect with amazing views, only a few minutes from the Keystone base, Dillion/Silverthorne shopping areas and was equipped with everything needed to cook, it was plenty spacious, great fireplace and easy parking. 16 year old and 11 year old shared 2nd bedroom with good space and bed set up. We drove to the mountain daily instead of using the shuttle as its a little bit of a walk when carrying ski's with the kids but that really wasn't a problem. Thank you for a great stay and having such a special place! Thanks so much for the awesome review Rick! We loved having you and it makes us so happy anytime we can share the joy that this place has brought to our family with others! Makes us happy to hear what a great time you had. We'd love to have you again next year! Safe Travels. great view and great location! We had an awesome time and can’t wait to come back for ski season! Thanks so much for your review and for staying at our place! We're so glad to hear that you enjoyed it, and we look forward to having you again soon! Pray for snow! Loved this very clean condo with amazing views!!! And the owners were a great help to us, too! Thanks so much for staying at our place - it makes us super happy to hear that you had a great time! Happy birthday again to your son and we would love to have you again sometime soon! There was good parking, and good access despite there being heavy snowfall. The covered garage parking was especially helpful for this! The condo itself has a great view and can be enjoyed from indoors as well as from the patio. The fireplace and heating was great. No issues with the rest of the place. It was great! Cristos - we're so glad you enjoyed your stay! Glad you enjoyed the fireplace and the view! What a cozy place to spend the Holidays, and glad to hear you had good snowfall! We hope to have you again soon.